One of the things that I love about the holidays is the food. My mom is the best cook that I know and so I tend to give myself a free pass when it comes to eating around Christmas time. Not only do I stuff my face on Christmas Eve, - yes I will have extra tortellini carbonara and chocolate mousse, thank you very much - but I am also sent home with leftover to continue the gluttony. I justify this behavior by reminding myself that my new diet and exercise plan will start on January first. Now I have a tool that can help me fight holiday fat. Every year my one and only resolution is to lose weight and get in shape. But every year I completely fail. This year I am determined to make a real go of it. My biggest hindrances seem to be lack of time and motivation. Now that I have a few hours with all four kids in school a few days a week, lack of time is no longer a valid excuse. However motivation is still something I need help with and probably always will. This site is something that can really help me with that. The feature that i think is the most helpful for me is the schedule. When you set up your profile it will have you select the kind of workouts you want to do and then put it into a schedule for you. Each day has a workout listed for you including what to do and video tips. When you set up your profile, you will also enter in your height and current weight plus your goal weight and it will calculate what you daily calorie count should be. You can then enter in everything you eat and drink to make sure you are staying within your goal. 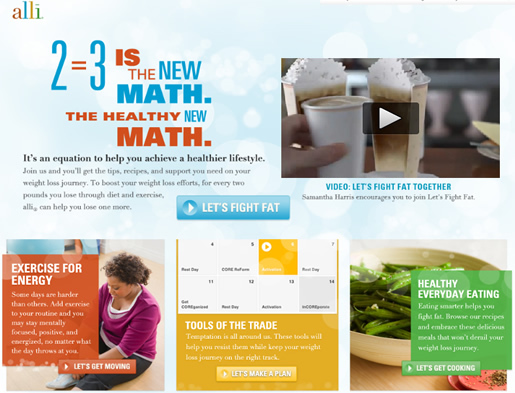 LetsFightHolidayFat.com has the tools you need to monitor your calories, help you find healthy recipes and set up an exercise routine to help you meet your fitness goals. I have only been using this for two weeks now but I am looking forward to continuing with it into the New Year. Especially once I start running in two days! What are your weight loss and fitness goals for 2013? Do you think LetsFightHolidayFat.com can help you get there? Sign up for free today and get started on a healthier you! I participated in a campaign on behalf of Mom Central Consulting for alli. I received a promotional item as a thank-you for participating. All thoughts and opinions are my own. I often am looking for things that my family and I can do for fun while staying home. We have family game nights with board games and movie nights with new rentals. My husband and I will have an occasional at home date night where we will rent a movie to watch once the kids are all in bed. Sometimes after a long day, the two of us enjoy a little gaming to help us unwind and relax. Wheel of Fortune and Jeopardy! provide the perfect opportunity for us to do that. • More than 2,400 new puzzles on Wheel of Fortune and over 3,300 new clues on Jeopardy! • Alex Trebek and Johnny Gilbert for Jeopardy! Not only did I get a kick out of the real voice-overs, but also the fact that they really made the video game hosts look like the actual hosts. 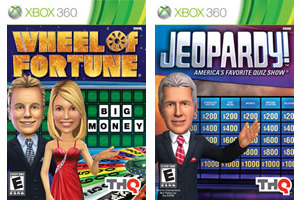 Both video games are very true to the actual game shows. Wheel of Fortune is my favorite game show so I really enjoyed playing this and I am pretty good at it, if I do say so myself. There are even Mystery Rounds, Prize Puzzles and everything else that you see on the actual show. One thing I learned is that I kind of stink at Jeopardy! It never was my strong suit, especially history based clues. I do fairly good with science and pop culture ones though so I guess that kind of makes my husband and I even. Or it would if he wasn't such a history buff. It is fun to play though and thankfully if you ring in for an answer, they give you multiple choices to choose from. So that can really help narrow down the correct response for you, especially if you are not 100% sure. Both of these games were a lot of fun for us. While our kids are not yet old enough for them, we enjoyed having the Xbox to ourselves for a little while. If you have older kids who can play Wheel of Fortune and Jeopardy! with you, these would be perfect for a family game night. Or if you are like us, they are great for mom and dad date night. Wheel of Fortune and Jeopardy! are available for Xbox 360, Playstation 3, Nintendo Wii, Nintendo Wii U and Nintendo DS. Please note that the opinions and views expressed in this review are my own and based on my personal experience with the product and/or company. You may encounter a different experience with this than I did. I received free product to review. For several years now, my go to brand for natural cleaning products has been Seventh Generation. Seventh Generation uses toxin-free, VOC-free, biodegradable and Biobased formulas in each product to ensure a healthy home and eco-friendly lifestyle. On the back of each product, they disclose every single ingredient used in the product so you aren't left guessing what might be inside. With Seventh generation products I know what I am getting and what I am NOT getting - harsh, toxic chemicals. This holiday season, I am keeping my house clean (or as clean as it can get with four little kids) with Seventh Generation. Whatever type of cleaning product you need, Seventh Generation has it. From laundry care to dishwashing to every day household cleaners and now even personal care products, they've got it all covered. I was recently sent some products to try out and I knew I would not be disappointed. While I have been using some of products for years now, like their Free & Clear Laundry Detergent and Dryer Sheets, all of the products shown above were new to me. I couldn't wait to clean! Wood Cleaner - I have to admit, the wood surfaces in my home are sadly neglected. Sure they get dusted every now and then but I rarely (OK, never) use a cleaner on them. This biodegradable formula leaves wood surfaces shiny and hydrated. My dining room furniture looked great after going over them with this. Natural Laundry Detergent Packs - I mentioned above that I have been using the Seventh Generation Natural Laundry Liquid for several years now and I was a bit perplexed by these monodose packs. I have never used anything like this before and I was wondering if they would really dissolve in cold water. Sure enough, they did and they left our clothes just as clean and fresh as the liquid dose. Avilable in Free & Clear and Mandarin & Sandlewood scents..
Automatic Dishwasher Pacs - With super hard well water, getting the dishes completely clean, even in the dishwasher, is a challenge. These did a good job and without the use of phosphates, chlorine and synthetic fragrances. The last thing I want is for my family to eat off plates coated in toxic chemicals. Hand Care Dish Liquid - I don't like to use gloves when I hand wash dishes, but then in the winter it results in super dry and cracked hands. Last year it actually got pretty painful. The new Hand Care Dish Liquid works hard on cutting through grease while also keeping your hands moisturized and soft. I am curious to see how my hands hold up over the winter. Available in Lavender & Vanilla scent or Free & Clear. With our youngest son's third birthday party this past weekend, Seventh Generation helped me clean up the house both before and after the party. And all while keeping toxic chemicals away from my family and I. 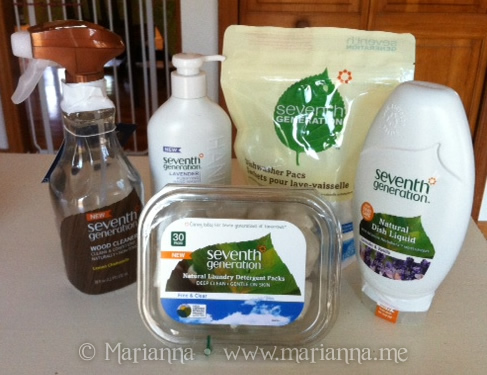 Seventh Generation products prove that natural cleaning products get the job done better. This giveaway is open to US residents only and will end on January 4, 2012 at 12:00 AM ET. Please use the Rafflecopter form below. Last year around this time, we received Skylanders Spyro's Adventure for our Wii to review. It was an instant huge hit with our boys and I admit even I enjoy playing it with them. We immediately became a Skylanders obsessed home. We have over 20 figures and a year later the boys still love playing this game. When I saw that ActiVision was releasing Skylanders Giants this fall, I just knew it was going to be another winner. Skylanders Giants builds upon the breakthrough fundamentals of Skylanders Spyro’s Adventure — merging the physical and virtual realms with an innovative line of cross-platform toys with "brains," which players everywhere can magically bring to life in the world of Skylands. Using the mystical Portal of Power, players once again lead a team of heroic Skylanders in an all new adventure to save their world. Portal Masters will journey through new areas of Skylands, encountering new enemies, solving fun puzzles, overcoming different hazards and obstacles, and finding a variety of collectable rewards and treasure. 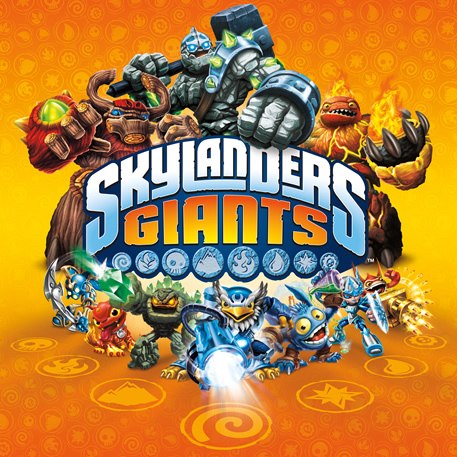 So obviously there is a new game, but what else is different about Skylanders Giants? Well first of all there are eight new Giant Skylanders characters. 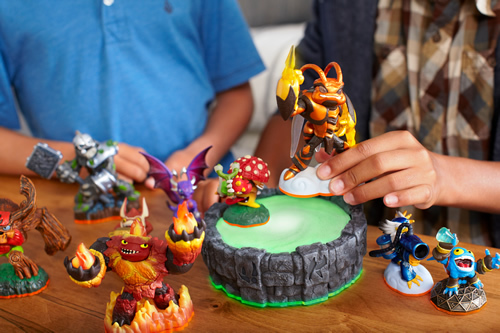 These figures are more than twice the size of regular Skylanders and they use their size to their advantage during the game. Giants can throw huge boulders out of their path, jump down from high ledges and more. Tree Rex is the Giant that comes with the game packs. We love the way the light shines through him. 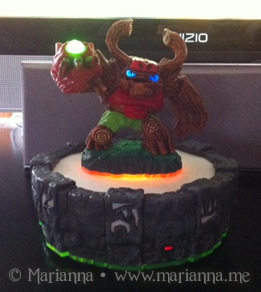 There are also new LightCore Skylanders characters that do the same. 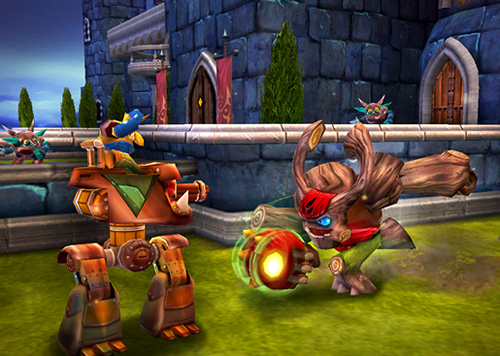 Additionally, the game features new Hero Challenges, more Battle Mode gameplay, and advanced integration across console, handheld, mobile and Skylanders Universe. Gameplay is a lot of fun and this time around there are different levels of difficulty you can play. I recommend the easy level for younger children but for older kids and adults, give yourself the extra challenge of playing on the more difficult levels. Skylanders Giants is hand down the gift to give this holiday. And I don't just mean the game and figures but all of the accessories too. I walked into Toys R Us yesterday morning to finish up my Christmas shopping and the amount of Skylanders stuff I saw was insane. Of course my kids are getting lots of it including Giants characters, storage cases, battle arena and more. If you are looking for the perfect gift for a child who enjoys video games, you cannot go wrong with Skylanders Giants. 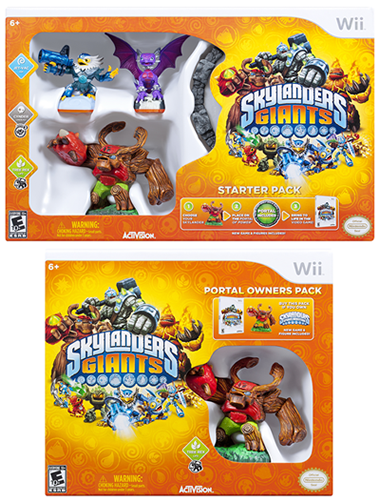 Skylanders Giants is available in a Starter Pack for $74.99 on the Wii, Wii U, Xbox360, PS3 and 3DS Platforms. For those who already have Spyro's Adventure and a Portal of Power, there is a Portal Owners Pack avilable for $59.99 on the Wii, Xbox360 and PS3 platforms. And don't forget to check out the FREE Skylanders iOS mobile apps: Cloud Patrol and Lost Islands. Even my three year old loves playing those on my iPhone. Please note that the opinions and views expressed in this review are my own and based on my personal experience with the product and/or company. You may encounter a different experience with this than I did. I received free product to review. This post contains affiliate links. 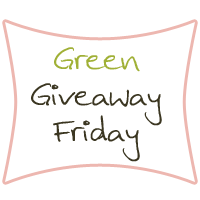 Please add both your green and non-green giveaways and contests into Mr. Linky below so we can do some giveaway hopping! Be sure to include the expiration date. Thanks! One of my biggest vices is sweets - I have a serious sweet tooth. Chocolate is hands down my favorite treat. No that's not true. Chocolate is my favorite food. Period. 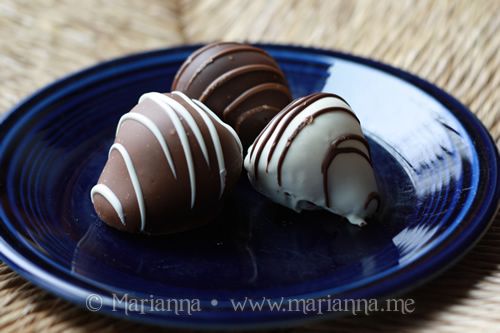 To me, there are few things better then some fresh fruit dipped into chocolate. And since its fruit, I consider it healthy. 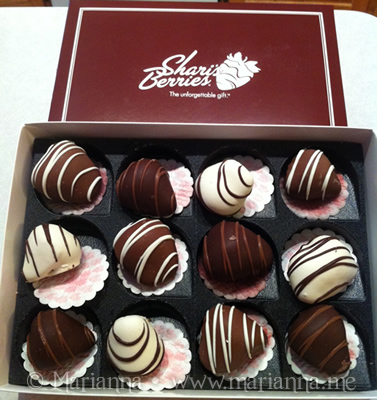 If you are looking to send someone (me) a sweet gift this holiday, Shari's Berries is the way to go. 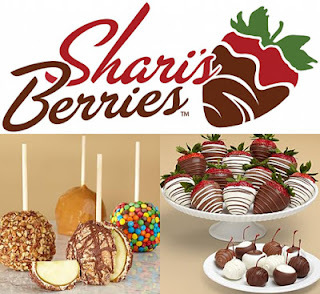 Shari's Berries has a wide variety of delicious, handmade, gourmet goodies that you can send to someone special. Since everything looks so good, it took me a long time to decided which items I wanted to try out. I eventually decided on their chocolate covered strawberries and caramel apples. The strawberries arrived in a cooler pack in a nice red box with a bow. It only took me a few seconds to dive right an and taste them. I am in no way exaggerating when I tell you that these are the best chocolate covered strawberries that I have ever had. The strawberries inside were fresh and crisp and the chocolate on the outside was rich and crunchy. 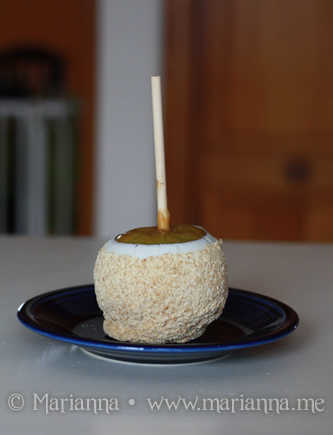 I also ordered a a 4-pack of hand-dipped caramel apples. It has been years since I have eaten a caramel apple while walking the Jersey Shore boardwalk so this was a nice treat for myself. And yes, I did keep all of these goodies for myself. I earned it. The apple shown below, is dipped in caramel and then white chocolate. Wow is really the first word that comes to mind to describe it. In addition to their hand-dipped fruits, which I love, Shari's Berries also has many gift baskets to choose from. For the chocolate lover there is a decadent Godiva basket, for the coffee lover a Starbucks basket and for the healthy eater there are organic fruit gift baskets. They have a basket or treat for everyone on your holiday shopping list. Before placing your order, make sure you check out the current Shari's Berries coupons. If you are ordering more than one item and your order is over $49 total, I highly recommend using the free shipping coupon. As a parent, the last thing I want is to have a dangerous products around my children. Since entering into motherhood, I have been pretty much bombarded with product recalls. We have had our cribs, car seats, strollers and more gear recalled several times over the past eight years and it can be hard to keep up. And lately with all of the food recalls that keep popping up, like peanut butter again, I need an easy way to check and see what any new recalls might be and if they affect my family. Checklists by Age - Select an age range to choose common products from easy preset checklists for Newborn, Infant and Toddler. Add Any Product - Track recalls on items you already own or want to buy. For example, Britax Stroller, Graco Toys, etc. Track Foods - Select from eight FDA-mandated food allergens to get alerts on related food recalls. For example, eggs, fish and peanuts. 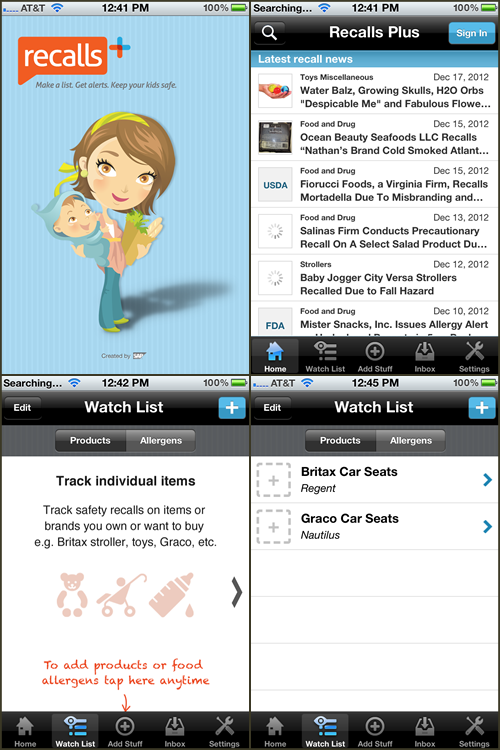 I downloaded the Recalls Plus App to my iPhone 4 and have been very happy with it thus far. It is very easy to get started and use. The home screen consists of a list of the most recent recalls. You can then create your own list of specific products that you want the app to watch for you. If a recall occurs of any of your products, it will notify you. It takes just a few seconds to add each item. The Recalls Plus app is a free app available to download from iTunes and Google Play and is also available on Facebook. Post inspiration provided through Linqia. All thoughts are my own. My family loves to watch Christmas movies, and once we pass Thanksgiving every year, we tend to watch them quite often. My favorite Christmas movie of all time is Rudolph the Red Nosed Reindeer while my husband's is Santa Claus is Coming to Town. I honestly think my kids love them all equally and as I type this they are enjoying Frosty the Snowman. 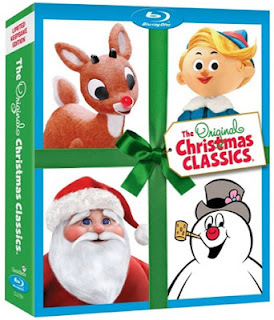 For any family that loves classic holiday flicks, The Original Christmas Classics set on Blu-ray is an absolute must have. In this two disc set, you get Rudolph the Red Nosed Reindeer, Frosty the Snowman, Frosty Returns and Santa Claus is Coming to Town. The only thing better than cuddling up on the couch and watching these classics with your family is enjoying delicious treats inspired by these very movies at the same time. Holiday baking is another great way for families to spend quality time together and kids will love helping out in the kitchen with these simple recipes that will remind them of the movies they love so much. 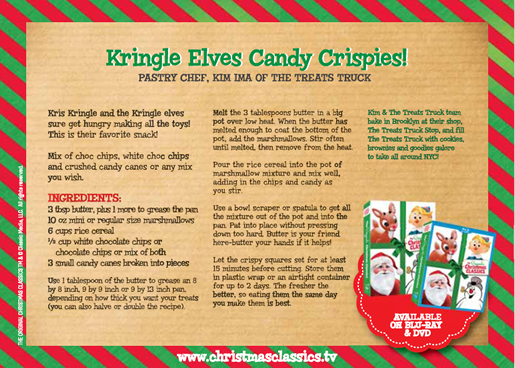 The Kringle Elves Candy Crispies are a festive twist on traditional rice cereal treats and my favorite of these recipes because I don't have to turn on the oven. Plus, who doesn't love those crunchy, marshmallowy treats? You can really customize these too and let the kids decide which types of candy they want to add and then help mix it all together. When its all cooled off, sit down and enjoy your sweets with the movies. This could make for a fun new family tradition. Egg Nog Panna Cotta with Citrus Cranberries & White Chocolate "Snow"
One (1) winner will receive The Original Christmas Classics Blu-ray box set (two discs). This giveaway is open to US residents only and will end on December 21, 2012 at 12:00 AM EST. Please use the Rafflecopter form below. Good luck! Please note that the opinions and views expressed in this post are my own . I received free product. So it is one week till Christmas and if you are like me, you are scrambling for last minute gift ideas. It never fails, I'm always running around the week before Christmas. And what makes great last minute gifts? Movies! Warner Bros. wants to help you find the perfect gifts while having a little holiday fun. Holiday Movie Challenge! Are you a true cinephile? Then take the WB Holiday Movie Challenge! Keep your movie skills sharp with this awesome quiz! Ready. Set. Go! Decode-A-Scene Game! Time is running out! Can you figure out what movie scene is slowly being decoded in front of your eyes? The sooner you figure it out the more points you earn! Holiday Survival Guide! Throw an epic holiday party this season! We have some awesome tips to make you look like a total holiday master! One (1) winner will receive a copy of either Peanuts Deluxe Holiday Collection, Classic Christmas Favorites or Dr. Seuss’s Deluxe Holiday Collection on Blu-ray. (Prize will be chosen randomly from the above Blu-ray titles. Winner cannot choose.) This giveaway is open to US residents only and will end on December 19, 2012 at 12:00 AM EST. Please use the Rafflecopter form below. Kids get sick. A lot. 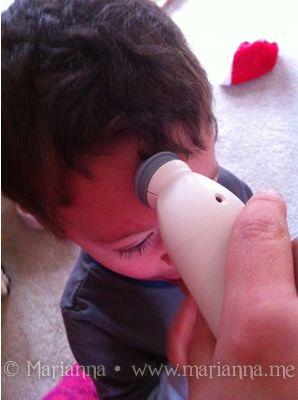 Taking an accurate temperature on little ones is not an easy task. When my first son was born nearly eight years ago, I chose not to get a temporal artery thermometer and boy was that a huge mistake. Huge. Because with an infant in order to get an accurate temperature I had to use a rectal thermometer. I did that twice before vowing to never do that again. And when I say never, I mean it. So for two years I went with those forehead strips or underarm thermometers. Until our twins were born. With three kids under two, I made an investment in the Exergen TemporalScanner and it was the best decision I could have made. The TemporalScanner Thermometer is a totally non-invasive system with advanced infrared technology providing maximum ease of use with quick, consistently accurate measurements. Advanced, patented technology measures temperatures with a gentle stroke across the forehead. 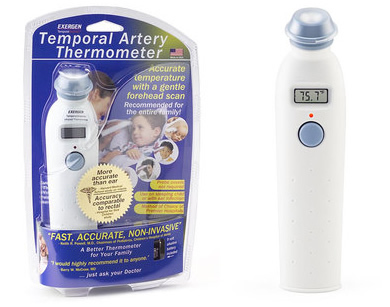 The TemporalScanner Thermometer has been clinically tested for accuracy compared to rectal thermometers and temperature sensors inserted in the heart during course of patient treatment and accepted for use in major hospitals, making it the ideal thermometer for use with newborns, infants, children or adults. For me, the Exergen TemporalScanner thermometer has felt like a life saver. Gone are the days of struggling with a wiggly infant to get their temperature or disturbing cranky sick kids. In under a minute, I can quickly grab an accurate temperature reading while barely disrupting whatever they are doing. And my favorite part? Being able to take a temperature when they are sleeping. I have done this countless times, especially during the infant years. Also great for toddlers who are constantly on the go! The Exergen TemporalScanner is really easy to use. Just gently stroke it across the forehead, crossing the temporal artery and it will beep to let you know when it is done. In just a few seconds you will have an accurate temperature reading. 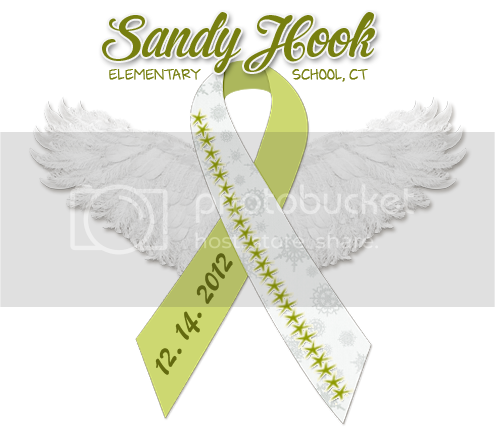 I don't know how I survived without this with my first son but I was so glad to have it with the rest of them. I definitely think this a must have for not only moms of newborns, but for any household with kids. The Exergen TemporalScanner is available to purchase at Target, Walmart, Babies R Us, Toys R Us, Costco, Sam's Club, BJ's, Rite Aid, Walgreens, Drugstore.com and more. One (1) winner will receive an Exergen TemporalScanner thermometer. Giveaway is open to US residents only and will end on December 27 at 12:00 AM EST. Please use the Rafflecopter form below. Good luck! Finding Nemo is probably my favorite Disney Pixar not only because of the great story and animation but also because it is hilarious. Ellen DeGeneres as Dory is perfect and I laugh every time we watch it. Though they are a little wary of the shark attack scene, my kids love this movie as well. 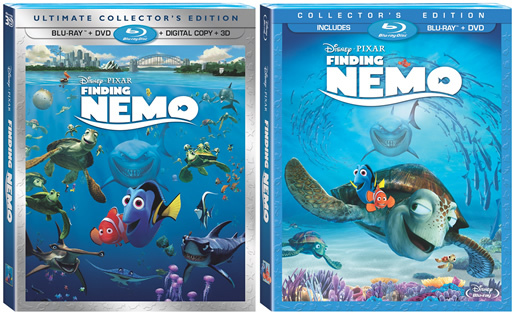 Just in time for the holidays, Finding Nemo is now available for the first time ever on Blu-ray and Blu-ray 3D. In this stunning underwater adventure teaming memorable comedic characters and heartfelt emotion, Finding Nemo follows the momentous journey of an overprotective clownfish name marlin (Albert Brooks) and his young son Nemo (Alexander Gould). When the two are unexpectedly separated in the Great Barrier Reef, Nemo is carried far from his ocean home and deposited in a fish tank in a dentist's office. Buoyed by the companionship of Dory (Ellen DeGeneres), a friendly-but-forgetful blue tang fish, Marlin embarks on a dangerous trek and finds himself the unlikely hero in an epic effort to rescue his son. In 2003, Finding Nemo won the Oscar for Best Animated Feature Film. Finding Nemo on Blu-ray is the perfect gift or stocking stuffer for this holiday season. 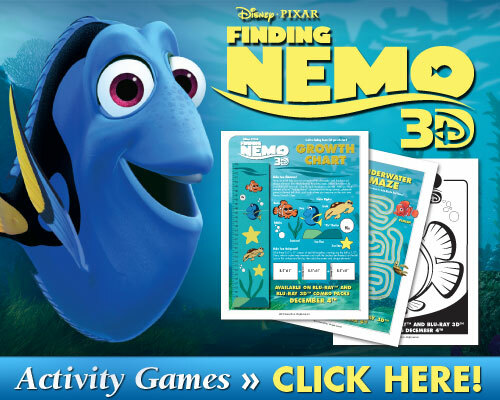 For extra fun, you can download these Finding Nemo activities for your kids to do during holiday break. I know I need all the help I can get keeping them busy! Connect with Finding Nemo on Facebook and on Twitter at @DisneyPixar. 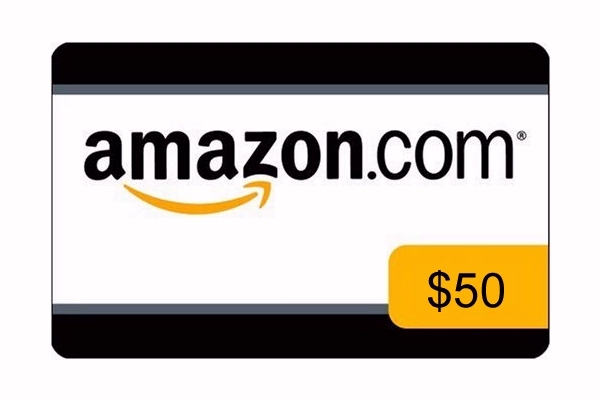 It is time for another one of my favorite giveaways - an Amazon Gift Card Giveaway! Amazon has come to be one of my favorite places to shop. Not only for eBooks and MP3 music, but for video games, movies, toys and well... everything really. Wouldn't you like to win a little Amazon money to help with your holiday shopping? Or maybe to buy something for yourself? One (1) winner will receive a $50 gift card to Amazon.com. Please use the Rafflecopter form below. Good luck! Giveaway brought to you by Lightbulb Wholesaler fluorescent lights. Visit the giveaway page here. I love listening to music throughout the day. Especially if I am cleaning or fixing a meal for the kiddos. A lot of the time, I listen to Pandora Radio on my iPhone 4. However, I never got a speaker for it so I can only listen to it through the phone's speakers, which really isn't loud enough while I am moving about the house. 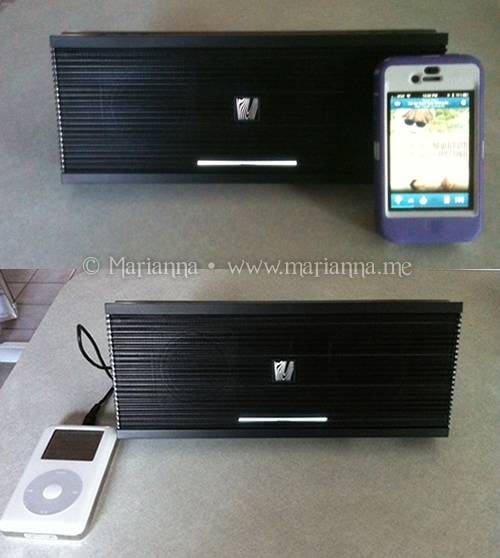 The Soundfreaq Sound Kick Speaker was the perfect solution for me since it is both wireless and Bluetooth enabled. iPad, iPad Mini, iPhone, iPod touch, Android, Blackberry devices and Windows and Mac PCs. Another important feature that I love is that it also has a plugin option so it can work with some non Bluetooth devices as well, like my ancient iPod. Since all of my music is on my iPod, this is great for me. Now I can bring the speaker with me in any room in the house without worrying about plugging it in and I can either listen to my tunes on my iPod or Pandora on my iPhone. And since it has a range of 30 feet, I don't need to have the device nearby, though I generally move them around together. Since this past week I started decorating the house for Christmas, this has been great for listening to holiday music. The kids and I love Christmas songs and I love that I was able to listen to them while I decorated each room of the house. 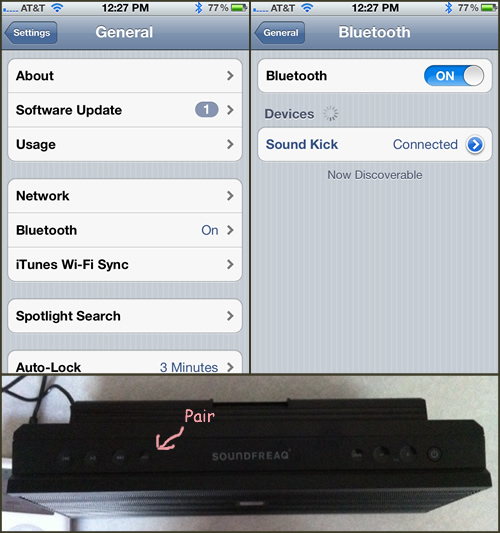 Setting up my Soundfreaq Sound Kick with my iPhone 4 was extremely easy and took about a minute. Once you fully charge your speaker, the light on the back turns green to indicate when it is done charging, turn it on and press the "pair" button. Once you do that, then navigate into Settings>General>Bluetooth to turn on your iPhone's Bluetooth and then you will see the Sound Kick pop up under devices to connect to. Your phone will store this so you don't have to do it again unless you are Pairing a new device. I do turn off my Bluetooth on the phone when playing games since the last thing I want to hear is Angry Birds Star Wars blasting through my kitchen. I could not be more thrilled with my Soundfreaq Sound Kick speaker. It has been perfect for me in that I can use all of my devices with it and I know that it will be compatible with any new ones I may upgrade to over time. The sound quality is great and so much clearer than if I listen through the phone's speakers. And I love that I can easily play music in any room of my house without having to plugin to an outlet. 7 hours on battery power (rechargeable) or can be plugged in. Plays any audio from your mobile device including music, movies, TV shows, videos, games, Internet radio and apps. Compatible with any Bluetooth device and will be compatible with future devices that have Bluetooth too so you don't have to worry when you upgrade. 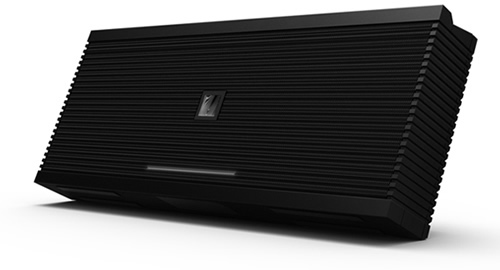 Sound Kick won Overall Best of Show from iLounge at CES 2012 and Gizmodo's award for Best $100 Bluetooth Speaker. 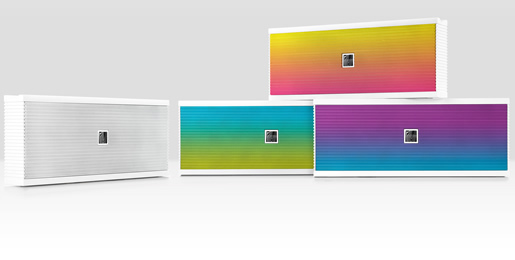 Three colorful brand new Chromatics editions available as well as a brand new all-white Ghost edition. Soundfreaq Sound Kick retails for $99.99. Available nationwide at Target, Radio Shack, Walmart, and Sears stores or online on Target.com, Soundfreaq.com, Bestbuy.com, Staples.com, Kohls.com. Sound Kick w/case option is available on Amazon.com. Sound Kick Chromatics and Sound Kick Ghost available only at Target.com and Soundfreaq.com. I wrote this review while participating in a blog tour by Mom Central Consulting on behalf of Soundfreaq and received a product sample to facilitate my review. All thoughts an opinions are my own.